Petitioning or assisting the victim in petitioning to determine an offending dog as Dangerous, thereby obtaining requirements and restrictions associated with the keeping of a Dangerous Dog. What Can Constitute a Dangerous Dog? What Cannot be Used to Constitute a Dangerous Dog? Determination based solely on breed of dog. A defensive act against a person who was committing or attempting to commit a crime (ex. 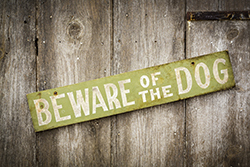 A burglar breaks into a residence and is attacked by resident dog). If a person provokes the dog by physically abusing, tormenting, teasing, assaulting, or attacking the dog. If you or your animal has been attacked by a dog, or you are an authorized representative for someone who has, you should seek medical attention if necessary and then call WCRAS to report the incident at 775-322-3647, 8 am - 10 pm daily or, for after hours emergency, call 911. Animal Control Officers are here to assist you. If the incident meets the criteria for a dangerous dog determination hearing, an Officer can assist you with making a request to file a complaint before an administrative hearing officer or a judge, and request the dog be determined dangerous. The purpose of the administrative hearing is to allow the victim as well as the owner of the dog in question to present evidence and testimony to the hearing officer or judge for consideration in the determination. The hearing officer or judge may make a determination that the dog is or is not a dangerous dog based upon evidence of the dog’s history or propensity to attack without provocation as outlined within WCC 55.750.